Eight years after separating its Messenger service into a standalone app, and five years after removing messaging functionality completely from the central app, Facebook might be gearing up to reintegrate Messenger into the main Facebook app (via The Verge). The news comes from app researcher Jane Manchun Wong, who found a rudimentary "Chats" section in the Facebook mobile app. 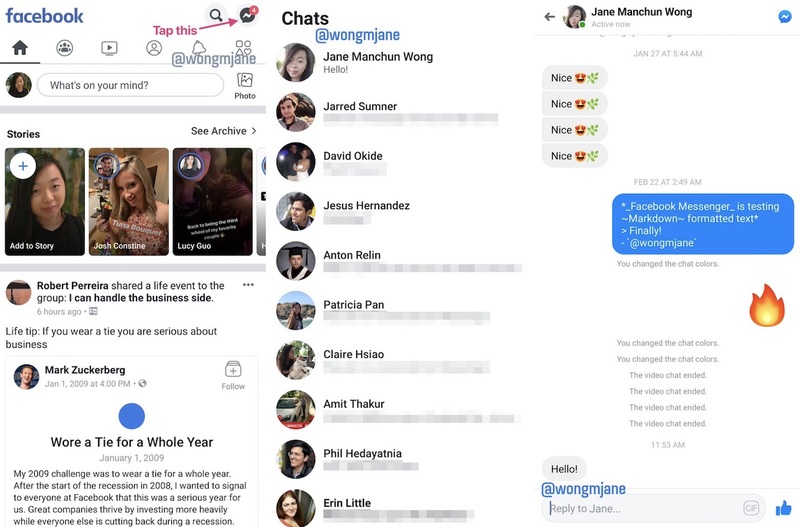 Whereas before the Messenger button would cause you to leave Facebook and open the Messenger app, Wong discovered that Facebook appears to be testing a new "Chats" area in the app. As of now, this area only contains basic chat functionalities, and lacks reactions, call support, photo support, and more. The change follows news that Facebook CEO Mark Zuckerberg wants to integrate the company's three messaging services -- Facebook Messenger, Instagram messaging, and WhatsApp -- into one "underlying messaging infrastructure." Each app will continue to exist following this update, but they will become interoperable so that a Facebook user can send an encrypted message to a WhatsApp user, and vice versa. According to Wong, this means that Facebook will also keep the separate Messenger app around even after it adds chat functionality back into the main Facebook app, because they will "serve different markets." All of the Facebook messaging services integration is believed to be an effort to keep people within the Facebook ecosystem and away from rival texting apps like Apple's iMessage. Update: Facebook has provided MacRumors with the following statement: "We are testing ways to improve the messaging experience for people within the Facebook app. Messenger remains a feature-rich, stand-alone messaging app with over a billion people using it monthly to connect with the people and businesses they care about most. We do not have any additional details to share at this time." "Facebook Potentially Planning to Kill Off Facebook"
I've already uninstalled the main FB app on my iphone, gives me an excuse to uninstall FB messenger. Just when will this cancer cell of human kinds simply die off? I hardly use FB anymore, but on occasion I do use FB messenger since people do contact me through that. If FB decides to merge messenger back into the main app, that guarantees I won't be logging in. Looks like their original plan backfired. People started using Messenger exclusively. It’s way too late now. Messenger has gotten cluttered as well. Also: Totally different Facebook App design if that's also iOS. That's a BIG design change moving the Nav bar to the top. Not sure if that will be great fun from a reachability standpoint if it happens. Old complaint: "Why are they splitting the apps? Now I'll have to install two apps!" New complaint: "Why are they combining the apps? Now it'll be all cluttered!"